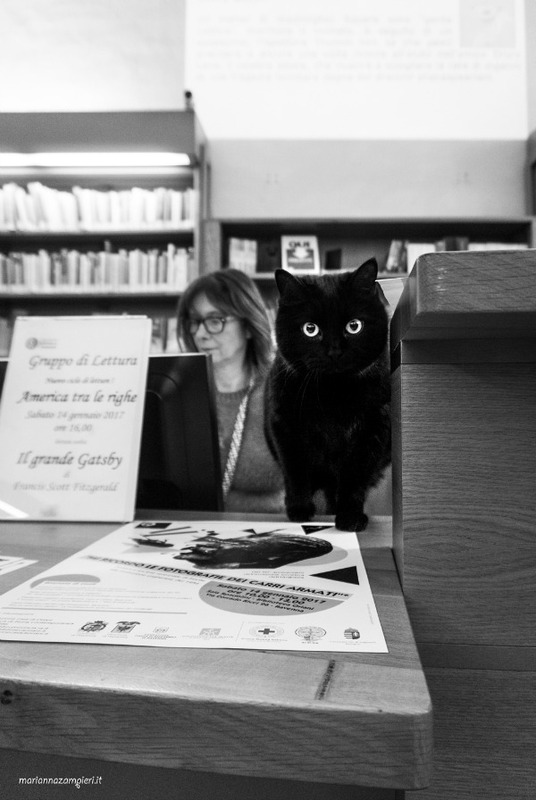 This is the second installment in a series of photos by Marianna Zampieri called C-AT WORK, featuring cats in the workplace. You can see part one here. 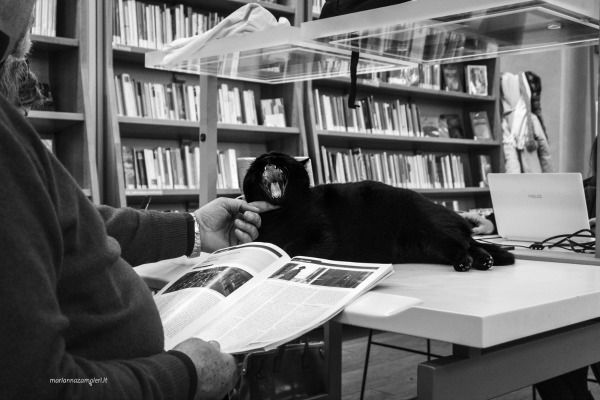 For C-AT WORK, photographer Marianna Zampieri went to Ravenna, to visit a true gem of Italian culture: the Classence Library. 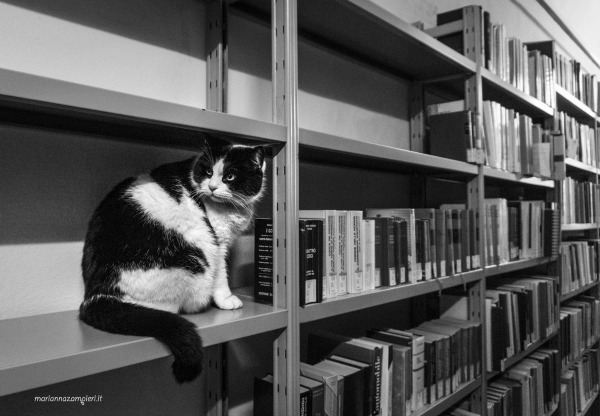 This extraordinary facility houses more than one million books from all eras and... three great cats. 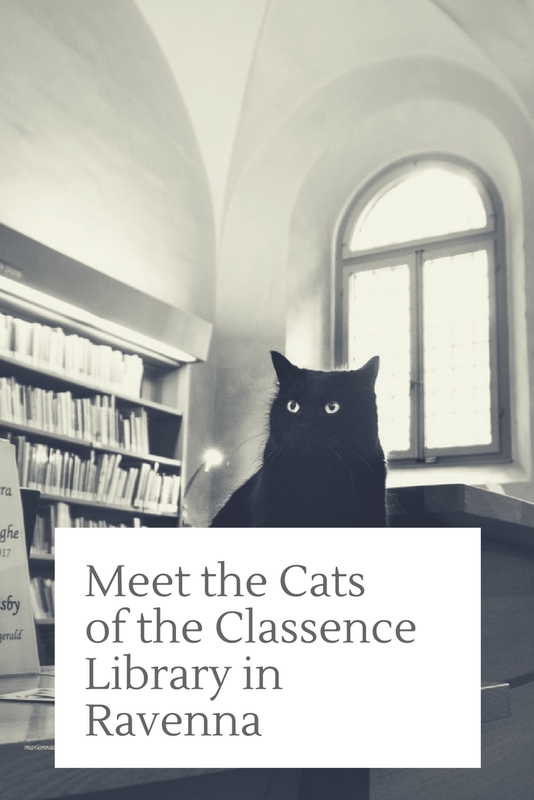 The employees of the Classence Library found the cats right after they were born. 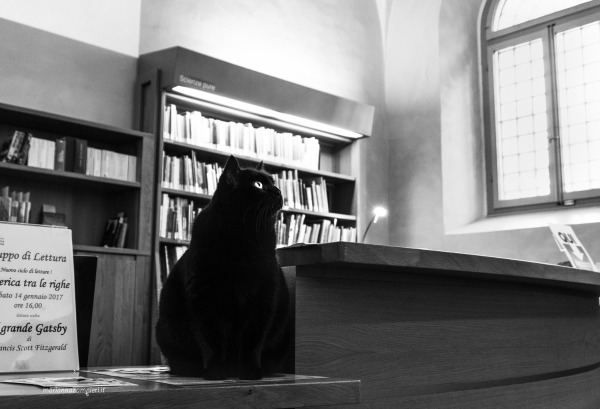 They weaned them and gave the cats a permanent home in the library. 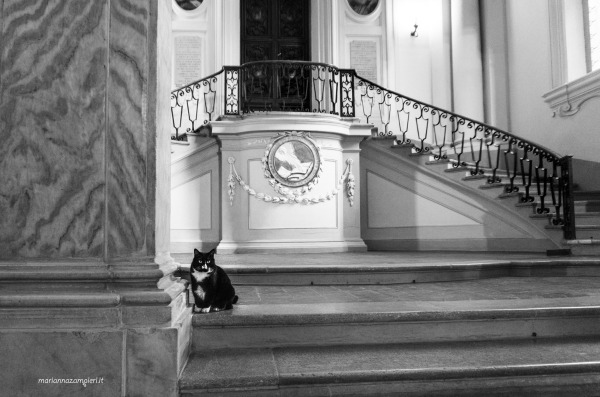 The black kitty is Obama. 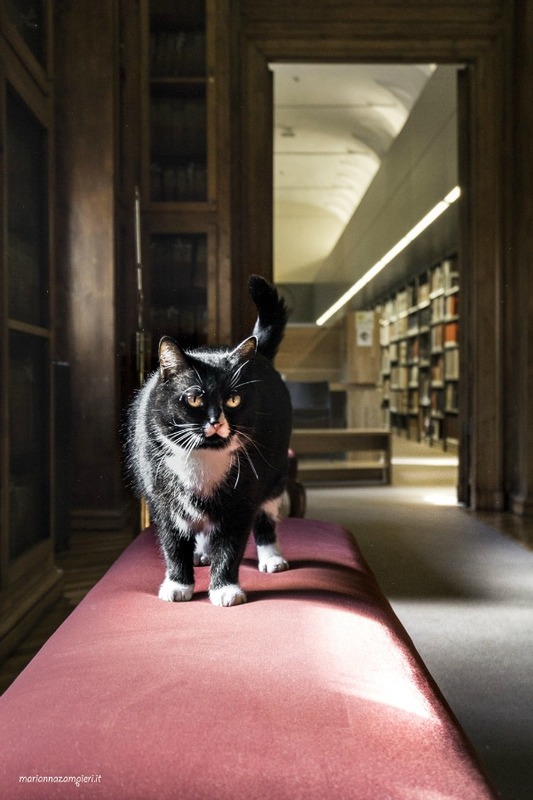 He's very approachable and deals with people who need company in the reading room. Then there's Byron. 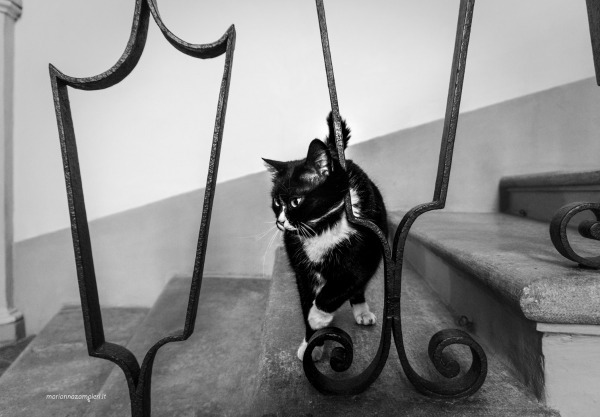 This black and white cat is a little reserved. 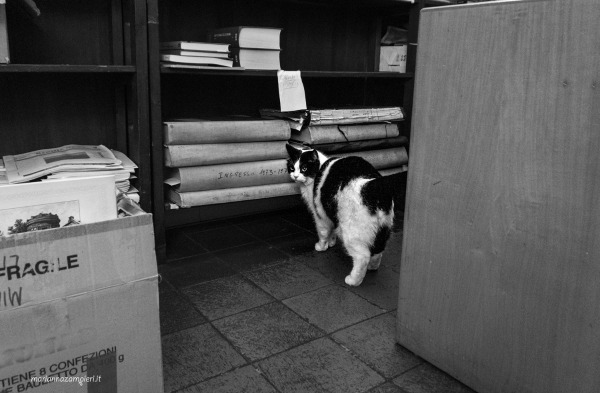 He prefers to hide in the archives. 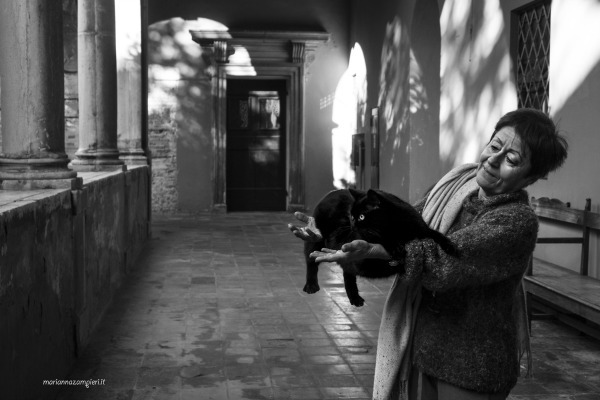 He has a disarming sweetness and is attached to the people who take care of him. 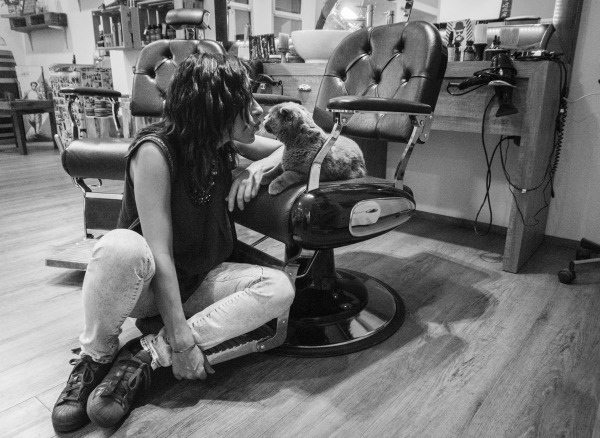 Finally, there's Teresa, a true diva. 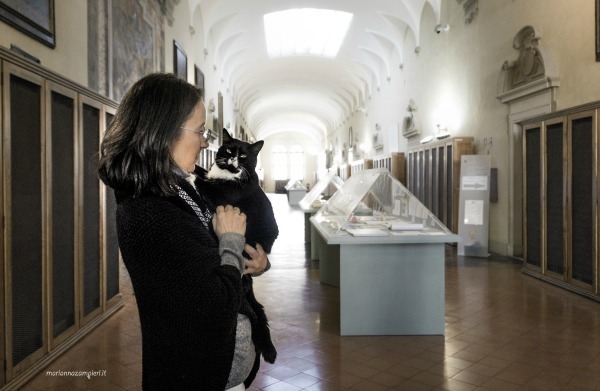 “She showed me the most beautiful places in the building and posed like a true model,” Marianna Zampieri says. 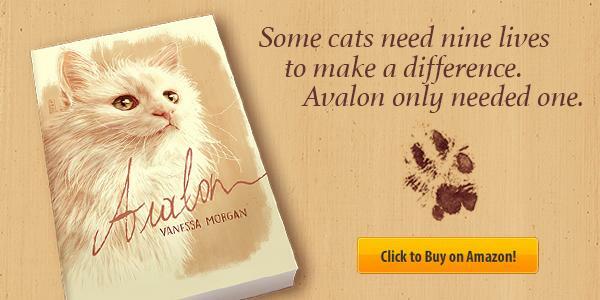 Read next => He was old, irritable, unhealthy, and miserable at the shelter. 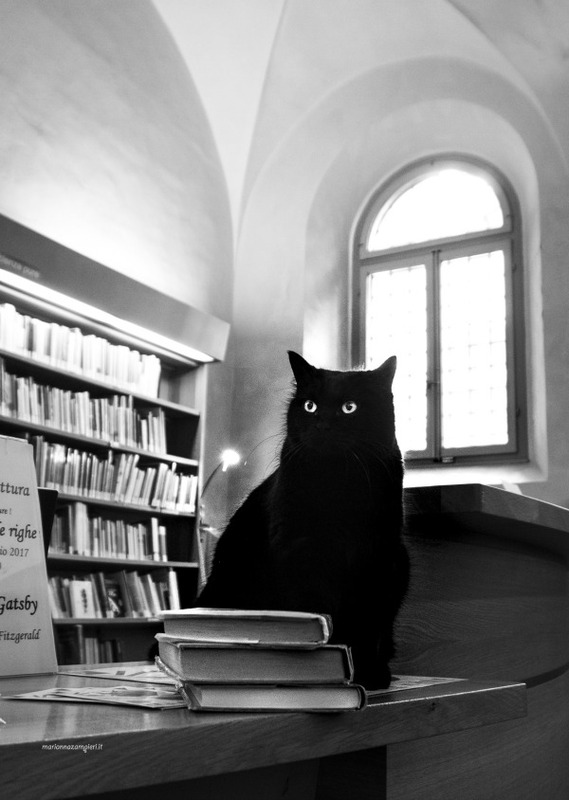 Now he's the happy guardian of the Second Edition Book Shop in Davie, Florida, and cares for every customer that walks in. 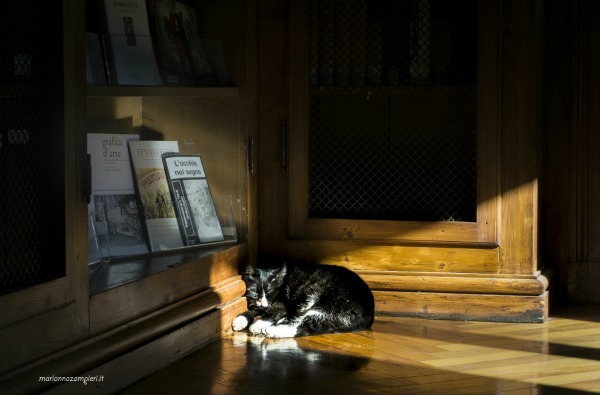 Meet Catsby, the 14-year-old bookshop cat! 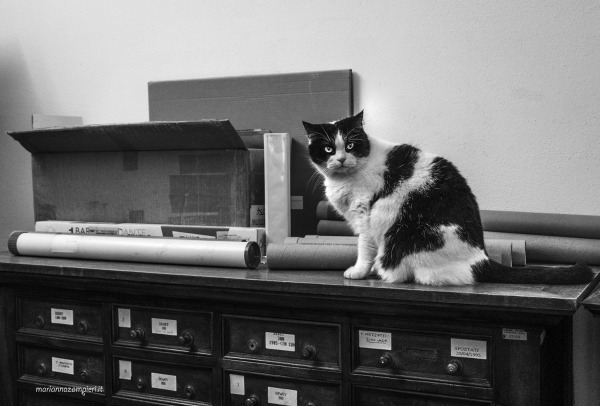 This is the first installment in a series of photos by Marianna Zampieri, called C-AT WORK, featuring cats in the workplace. 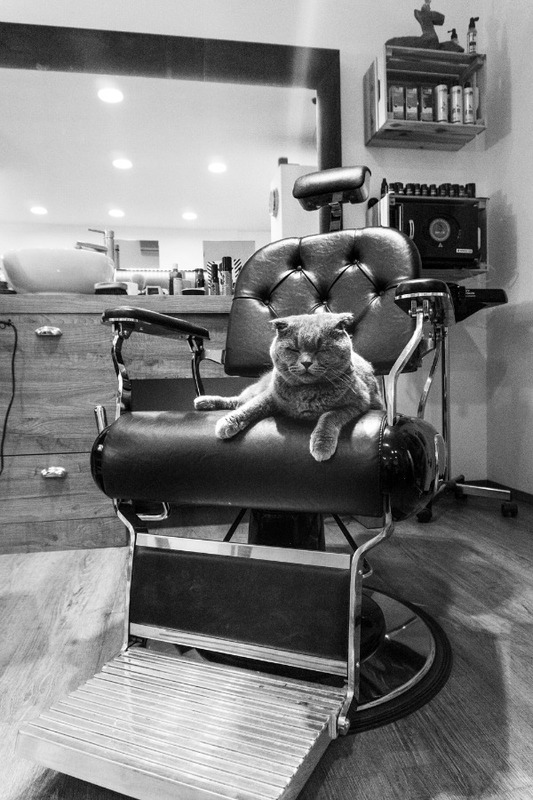 We begin with Matisse, a pretty Scottish Fold who's a skilled hairdresser and PR manager. 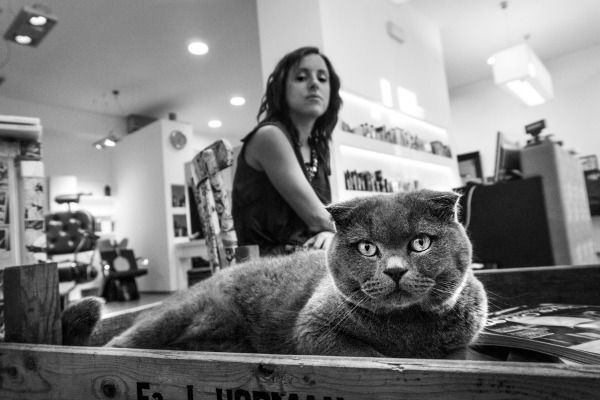 Together with his human, Sara Norelli, he works in the beauty salon and barber shop Rebelle in Vicenza, Italy. 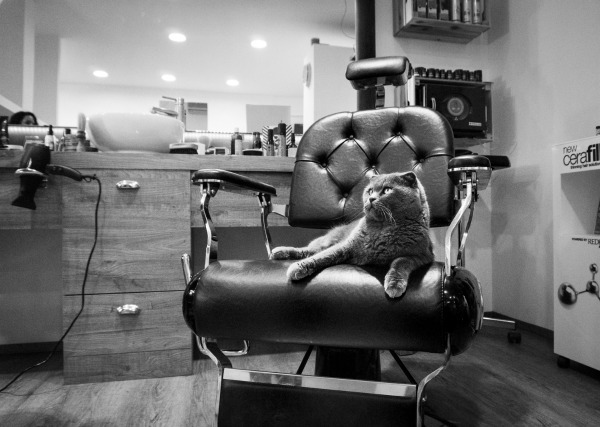 Like any good PR cat, Matisse welcomes all people with cuddles, head bumps, and extended lap sessions. 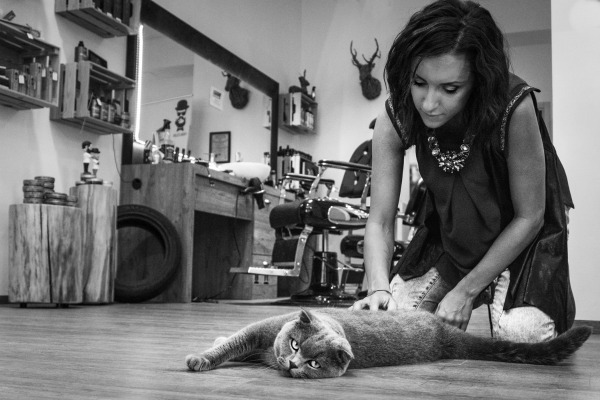 However, nothing beats the love this Scottish Fold expresses for Sara. 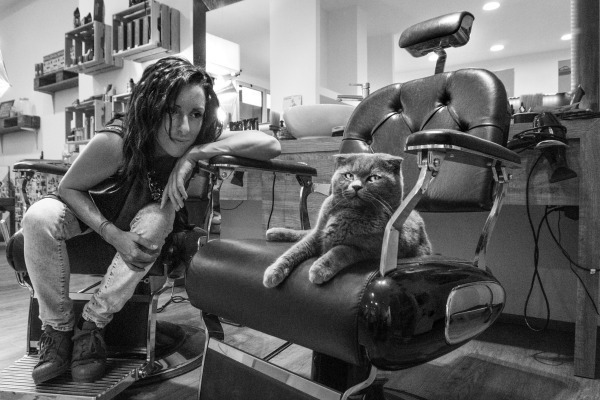 Are you ready to have your hair cut by Matisse and Sara? 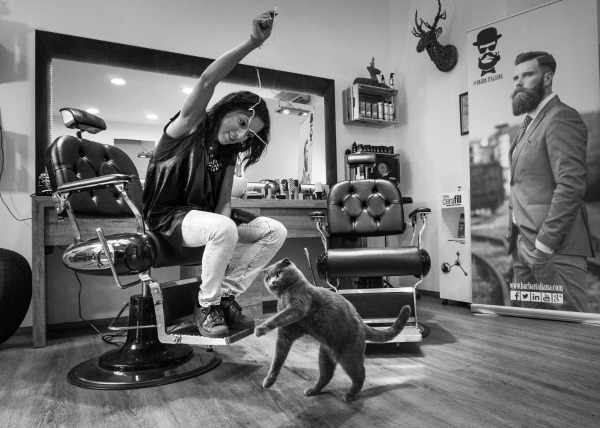 You can visit the beauty salon and barber shop Rebelle at Viale Grappa 18 in Vicenza, Italy. 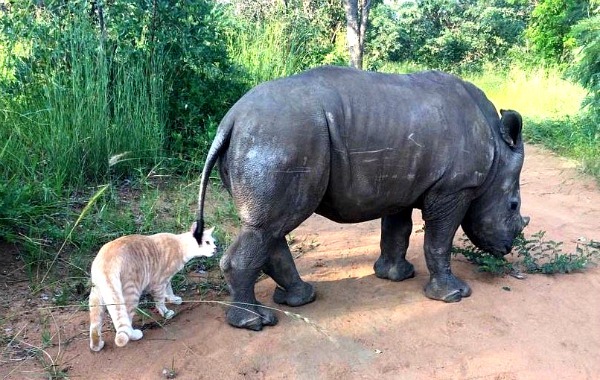 Let's celebrate with a series of pictures of a heartwarming friendship between a baby rhino and a rescue cat. 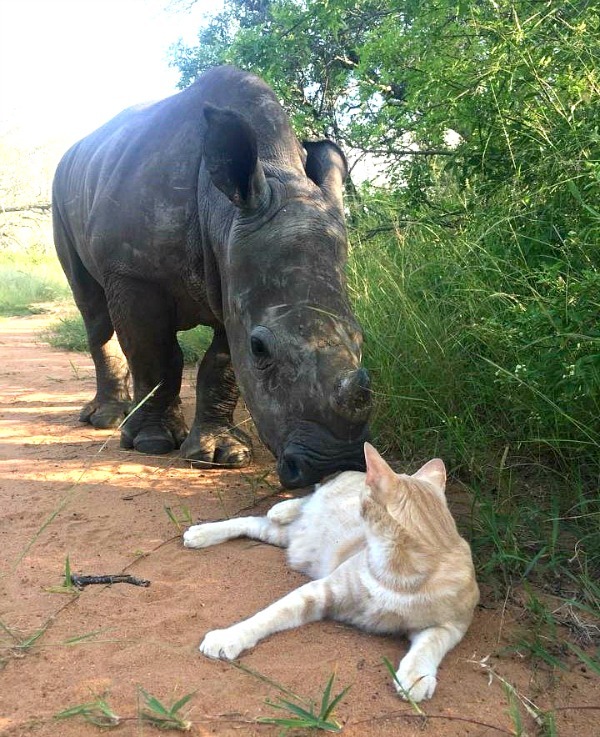 Nandy the baby rhino and Mewie the rescue cat live at the Rhino Orphanage in Limpopo, South Africa. 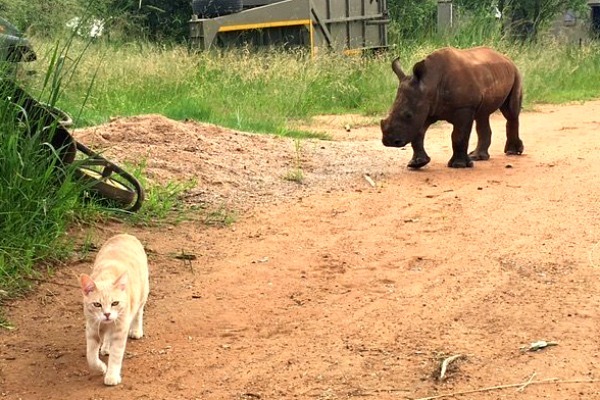 The caretaker for the orphaned rhinos rescued Mewie from a township when he was a kitten and nursed him back to health. Then came Nandi. 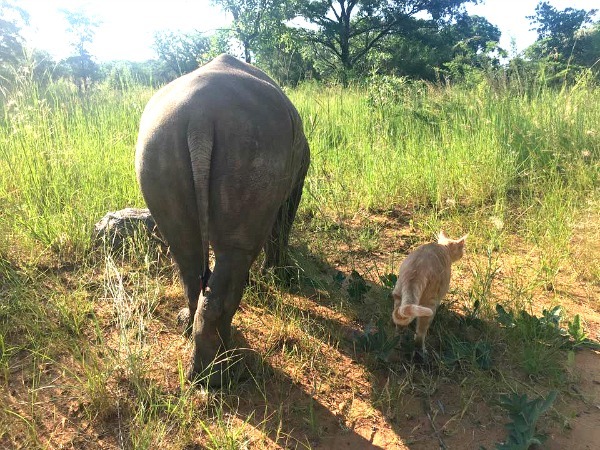 She arrived at the Rhino Orphanage when she was only two months old. Her mother was tragically lost to poaching and was left wandering alone for days. The little, orphaned rhino was so hungry she ate sand which caused damage to her tummy. 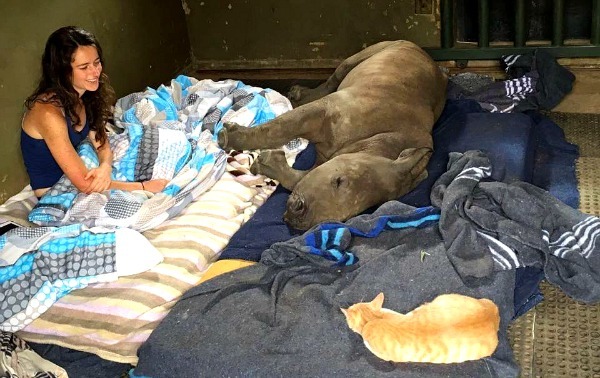 She was saved and taken into the Rhino orphanage. 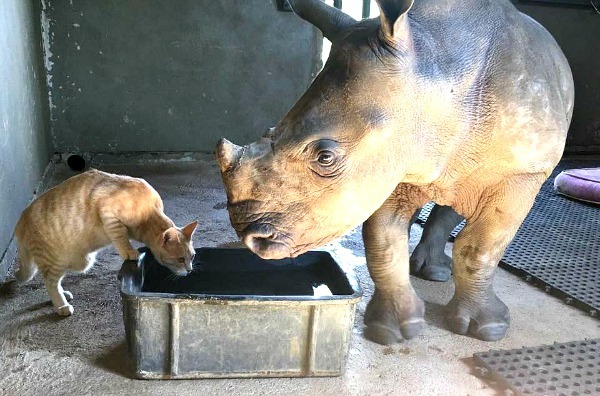 The friendship between Nandi and Mewie began when the caretaker started to sleep in the same room as Nandi. Mewie didn't want to be left out, so he curled up on the bed with them. It didn't take long before their curiosity turned into a friendship. 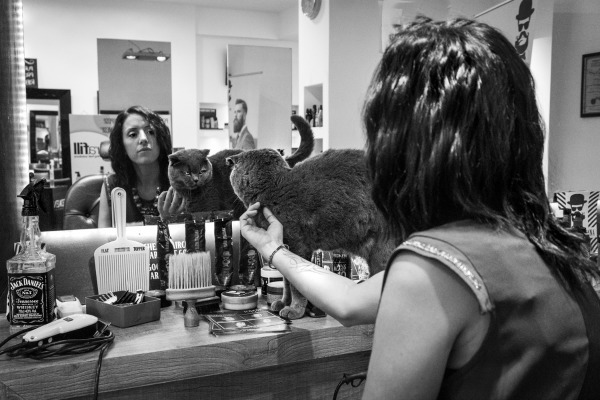 Both grew up without a mother, but now they are each other's family. They are so fond of each other they always want to be in each other's company. 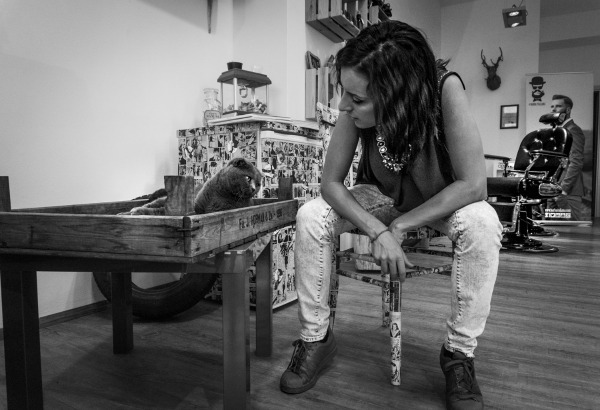 What Mewie and Nandi really enjoy is their twice-daily walks together. When one of them runs, the other one always tags along. 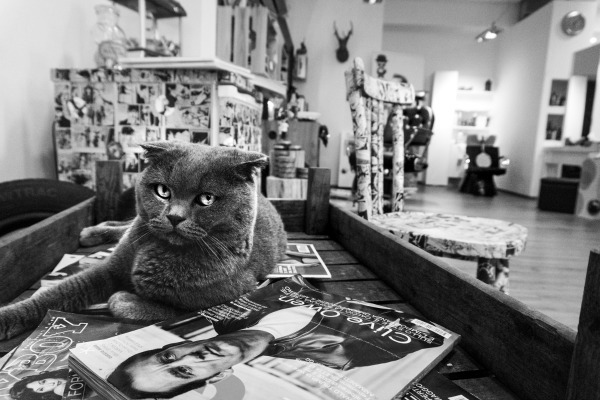 Though Mewie purrs and Nandi snorts and squeaks, they share the same language of love. 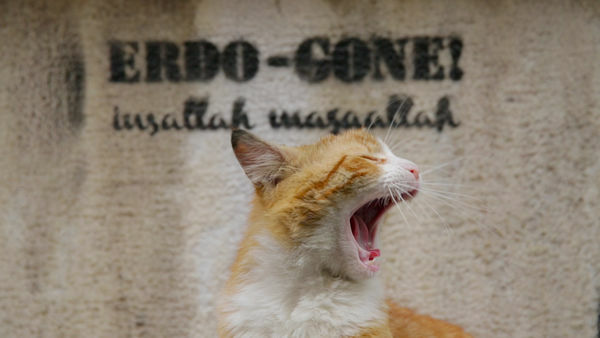 A new cat documentary is hitting theaters today: Kedi (aka Nine Lives: Cats in Istanbul). 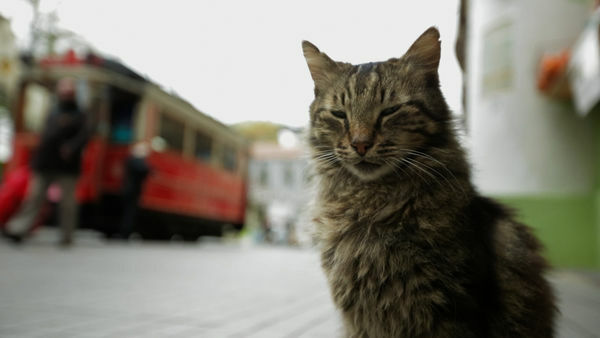 Istanbul is widely known as a city of cats. 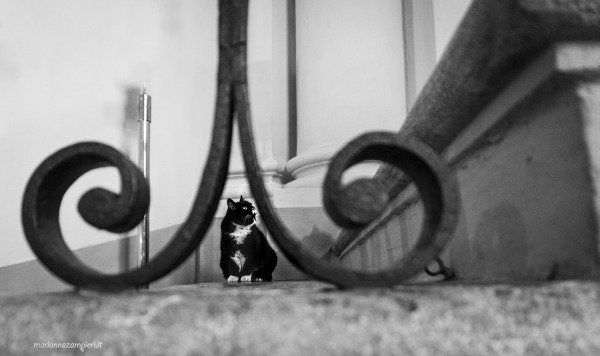 Hundreds of thousands roam the metropolis freely. 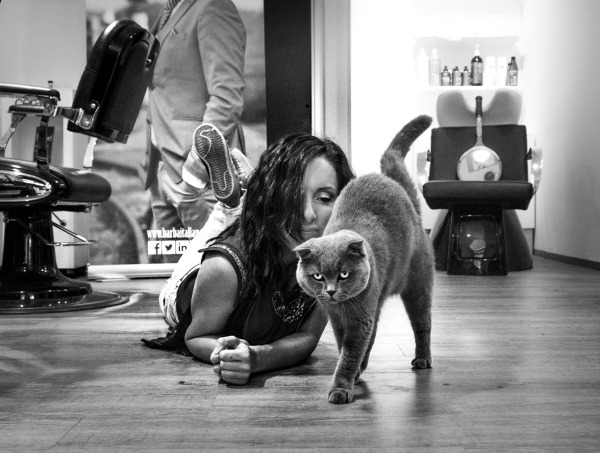 They are neither wild nor tame. 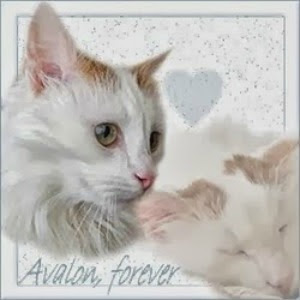 Though they claim no "owners," they bring joy and purpose to those people they choose to adopt. 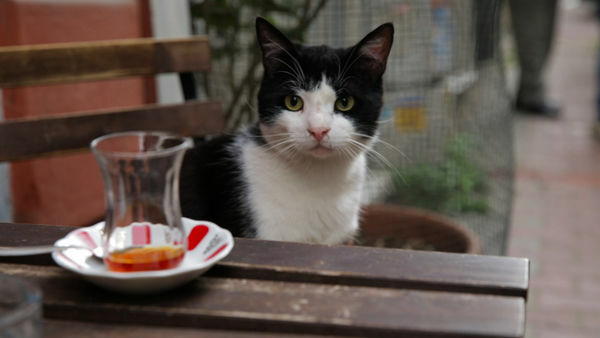 In Istanbul, cats are the mirrors to the people, allowing them to reflect on their lives in ways nothing else could. 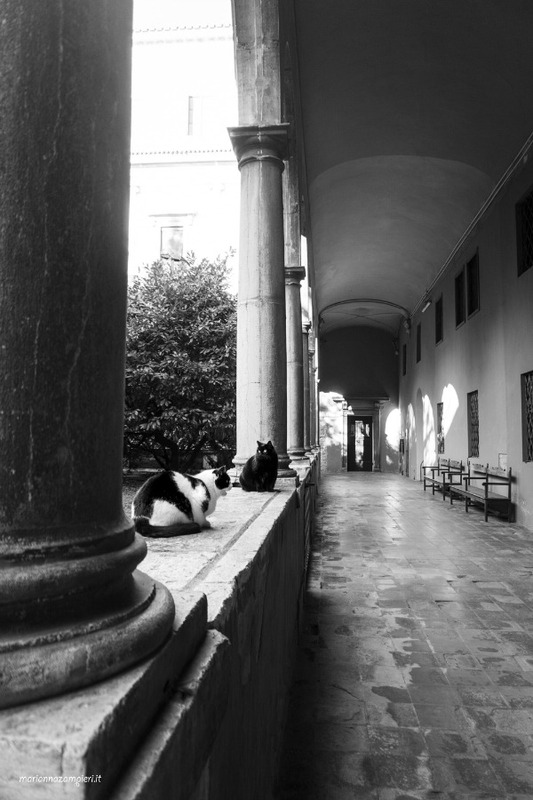 "Every year that I returned to the city, I saw it change in ways that made it less and less recognizable, except for the cats; they were the one constant element, becoming synonymous with the city itself and ultimately, embodying its soul," says Kedi director Ceyda Torun, who grew up in Istanbul in the early 1980s. 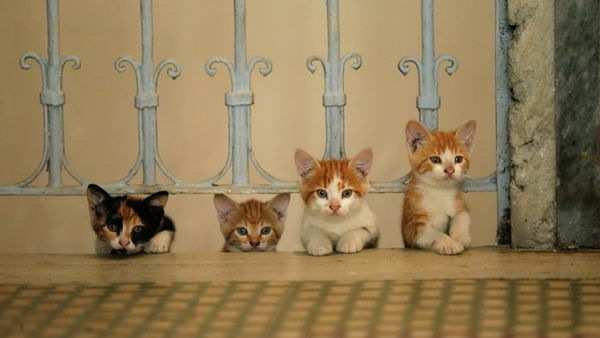 "This film is, in many ways, a love letter to those cats and the city." 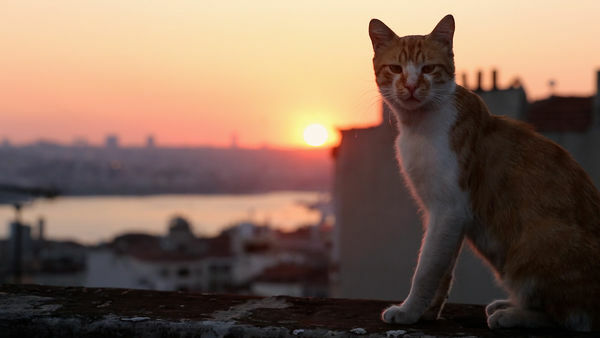 In their effort to capture as much of the cats' individual lives and secrets as possible, director Ceyda Torun and cinematographer/producer Charlie Wuppermann experimented with various "cat-cameras" to follow the animals into dark alleys and deserted basements and they flew drones over the rooftops for a more general view of Istanbul and its feline inhabitants. 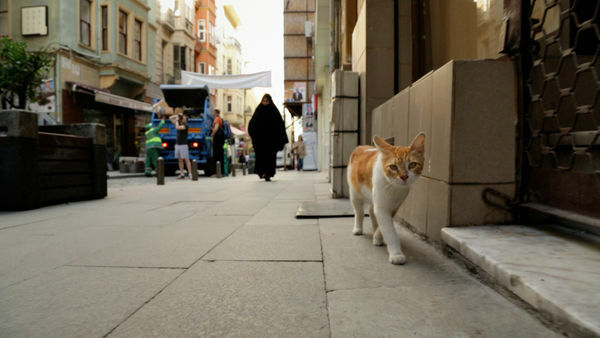 They pretty much stalked the cats in Istanbul for several months which resulted in many over-the-shoulder shots as the cats navigated the city streets. 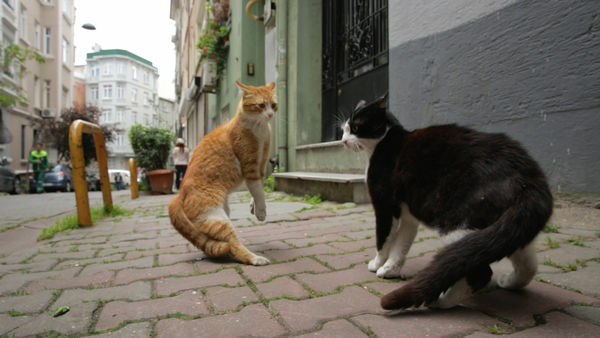 The filmmakers also talked to locals that had extensive knowledge of the street cats and had bonded with them in sometimes unusual ways. 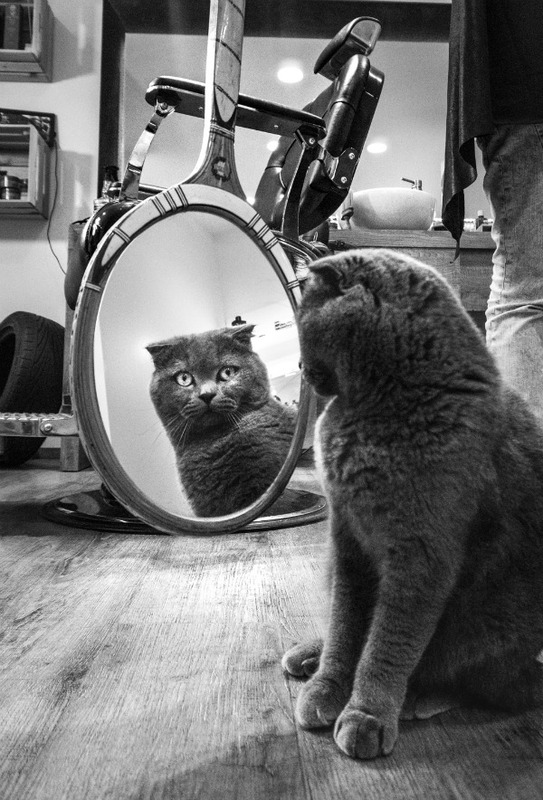 Turns out each cat has its own unique personality and "goal" in life. 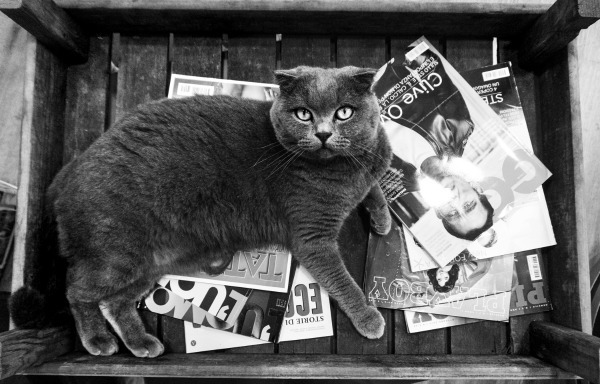 Some cats only live for love while others have nothing but food on their minds. There's the psycho, the social butterfly, the player, and the thief. 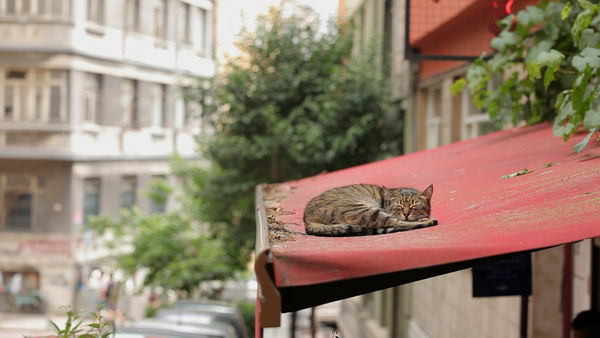 With backgrounds as varied as their human counterparts, the street cats in Istanbul experience the city in ways totally unknown to people. 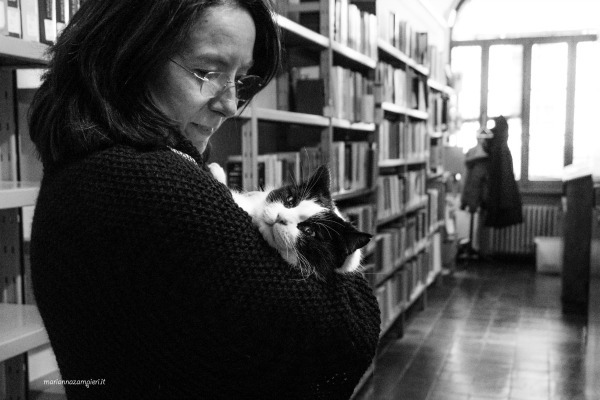 "Everyone who had allowed themselves to form a meaningful relationship with these creatures had come to experience life and their part in it differently," says Ceyda Torun. 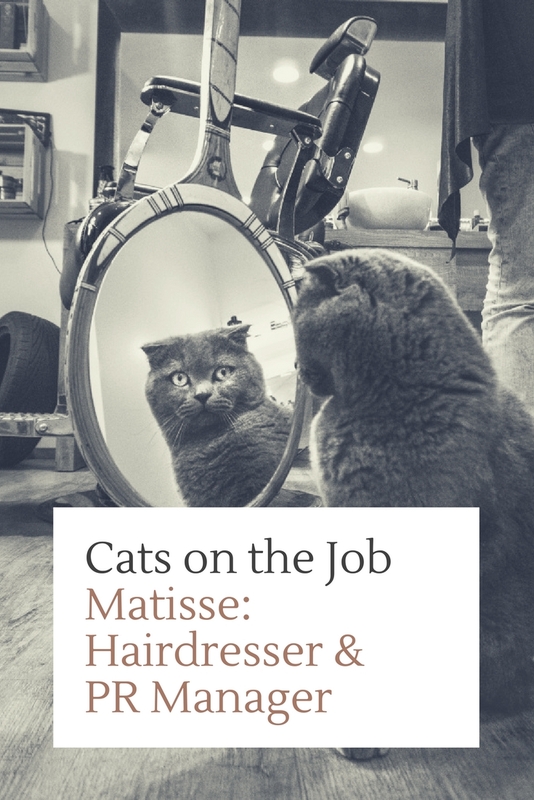 "The degree of this profound change in perspective varied from person to person, but one thing remained constant, it was brought on by having the opportunity to co-exist with an animal with charm, intellect, and self-sufficiency." 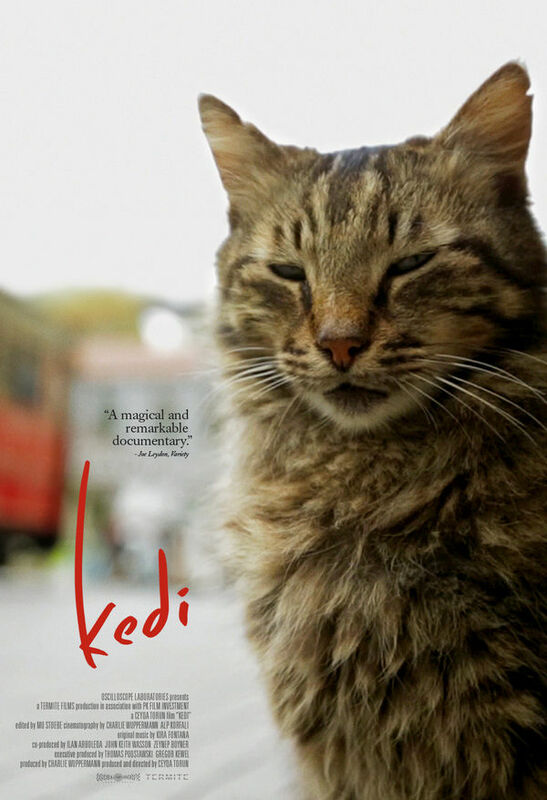 We haven't seen Kedi yet, but judging from the trailer, the film looks both stunning and touching. 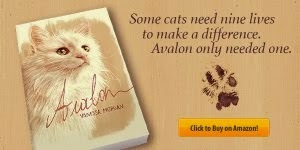 Have a look and let us know what you think. 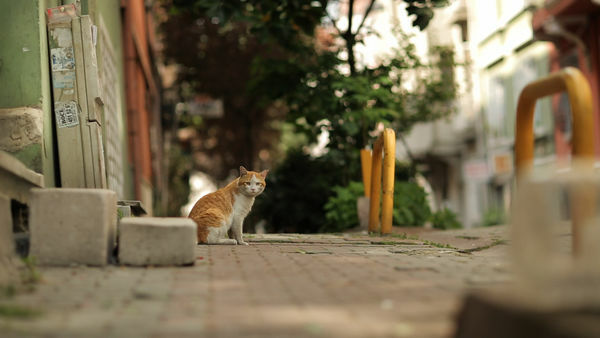 Is Kedi (aka Nine Lives: Cats in Istanbul) a documentary you would consider watching?